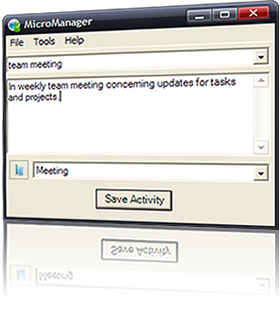 MicroManager Time Tracking - Fire Your Boss. The easy time tracking software that asks what your working on periodically. No more remembering what you did when your time sheet is due. Just run your own report. You don't mind IM'ing during the day. This is just that easy. Get prompted to enter what your working on, classify under a project, and hit enter. Done! Set up the projects your working on so that you can enter your activities under them. Now that you have your work entered and classified, run a report to see what you did. You'll be surprised at how busy you've been.